Chapters Indigo has their Pre-Black Friday Sale on now! Plus they have a promo code coupon to even sweeten the deal! 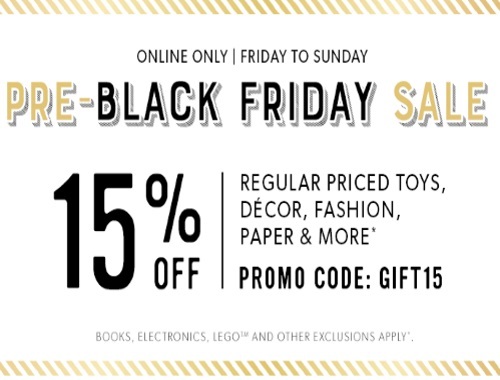 Save 15% off regularly priced toys, decor, fashion, paper and more! Enter the promo code GIFT15 at checkout to get the discount. Offer is valid until Sunday, November 19, 2017.